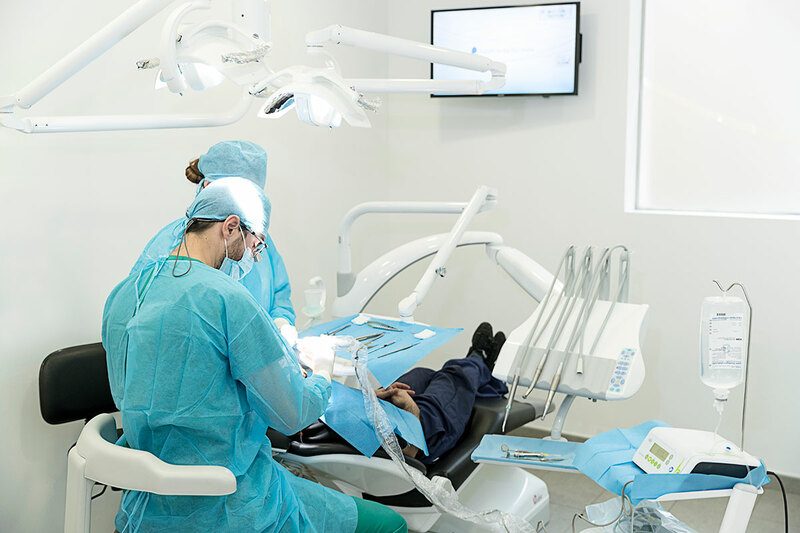 This area of dentistry encompasses several specialities and involves rehabilitating the whole mouth when it is in very bad condition to improve the function and appearance of the mouth, so the patient can live a normal life. Some cases of oral rehabilitation also involve orthodontics, when the position of the teeth needs to be changed or improved to ensure an excellent result. For oral rehabilitation or full mouth dental treatment it is essential to plan the case in detail. Each phase should be planned step-by-step before treatment begins, allowing time for the setbacks that may be encountered when carrying out a full mouth dental treatment. This type of treatment usually involves a range of specialities, making it essential that after the patient’s first appointment with the dentist, the dentist meets with the different specialists involved in the case to present the initial treatment proposal for the patient. The specialists agree on a definitive dental treatment plan or make modifications to the treatment. Once the definitive dental treatment plan has been decided after consultation with all the specialist dentists, the sequence of treatments will be organised, and time allocated for each phase. The patient is then informed, and appointments are made to begin the full mouth dental treatment. The treatment usually begins with designing the treatment plan. The dentist specialising in oral rehabilitation is responsible for this design and takes a series of photographs and moulds of the mouth to begin this initial stage of the treatment. With this information and using sophisticated computer systems, the dentist produces the smile design. Our dental clinic in Barcelona is one of the few centres to be certified in cutting-edge smile design technology, Digital Smile Design. Once the dental treatment has been designed, the cleaning phase begins. This stage involves dental treatments to clean and disinfect the mouth. This cleaning phase includes dental hygiene treatments or periodontal treatments (gum treatments), tooth removal of any teeth that cannot be preserved because they are in poor condition, treating infections produced by advanced decay, endodontic treatment (root canal) and treating decay (fillings). If necessary, the next stage will involve surgery with procedures to replace bone or bone grafts and fixing dental implants. Where orthodontic treatment is needed it will be carried out before implants are added. The last stage is adding dental prostheses to the whole mouth with porcelain crowns or zirconia crowns and dentures on implants if necessary. These types of full mouth rehabilitations are usually carried out on patients who have not paid a visit to the dental clinic for a long time, either out of habit or because of a fear of the dentist, and this means their mouths are in very poor condition. Also, in many cases these patients develop problems that can only be treated by specialist dentists, like periodontal disease or gum disease. That is why one of the most important aspects of the treatment is convincing the patient that after they have spent so much time and energy on a full mouth rehabilitation with dental implants, porcelain dental prostheses or prostheses on implants and many other dental treatments, it is essential to go for regular check-ups to keep their full mouth dental treatment in good condition. In the same way that teeth can be damaged by the bacteria that live in our mouths, dental implants can also be colonised by these bacteria and suffer what is known as peri-implantitis. It produces the same effects as periodontitis on the teeth and can lead to bone loss and in the long term the dental implant can fall out. That is why it is important to attend dental check-ups every six months. This is also the case for patients without dental implants. For instance, even if a dental nerve has been treated and a crown or cap has been added, the tooth can be affected by decay again and the reconstructed tooth can be destroyed. Because the tooth has lost sensibility, when it is affected by decay, the patient does not notice, does not feel pain and the decay can irreversibly damage the tooth. Regular check-ups with the dentist can detect this decay and the tooth can be reconstructed before it is too late. Visiting the dentist every six months for a check-up ensures good dental health and mean your full mouth dental treatments are successful in the long term.